With an imminent return to Earth scheduled for Russian cosmonauts Alexander Svortsov and Oleg Artemyev, there has been a lot of activity on the ISS this week. However, one particular development gave legs (literally) to a whole new set of ideas. Commander Steve Swanson has been making some serious strides on the ISS's synthetic spaceman Robonaut, www.waaytv.com reports. The humanoid helper, who happens to be a robot, has long aided the ISS crew with experiments, and now thanks to Swanson's "robot surgery", Robonaut has gained a whole new range of motion. Formerly a head, torso, and two dexterous arms and hands, Robonaut now has a pair of legs to aid him in station science endeavors. 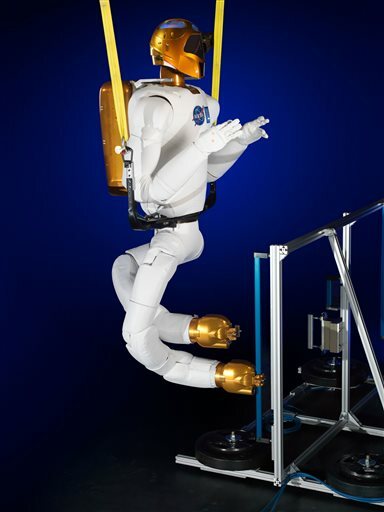 This frees up Robonaut to scoot around the station doing maitenance, like a cooler version of the Jetsons' Rosie the Robot, allowing the human astronauts to do the more complex scientific tasks that we went to space to work on in the first place. However, the badass 'bot will get his chance to act like one of the real boys (and girls) when he takes his first spacewalk later this year.